This vintage real photo postcard features actress “Miss Mary Grey”. A search for biographical information about Miss Grey was not very fruitful. It should be noted that postcard portraits of Mary Grey are rare. Only one other postcard image of Miss Grey could be found, and it was a different pose than the one above. I found a morsel of information about one actress named Mary Grey but I can not verify that the Mary Grey seen in this postcard is the same Mary Grey that I am about to describe. Mary Grey was an actress known for her appearance in the British musical film”His Majesty and Co” (1935). She was married twice. Her first husband was James Bernard Fagan, an Irish-born actor, theater manager,producer and playwright in England. This postcard is part of the Rotary Photographic Series (no. 4954 B) published by Rotary Photo. Note the actresses winter coat, collar brooch, and fancy hat. The photograph was taken by the Foulsham & Banfield Studio. Foulsham & Banfield were well known celebrity photographers. Frank Foulsham and A. C. Banfield operated a studio in the 1900’s through the 1920’s. This real photo postcard is in very good condition (see scans). This vintage real photo postcard features celebrated stage actress Miss Lily Elsie (1886-1962). At the time of her portrait sitting for this image, Miss Elsie was also known as “Mrs. Ian Bullugh”. More about that later. Lily Elsie was a very popular English actress and singer. She was most known for her starring role in the London production of “The Merry Widow (1907)”. The show ran for 778 performances. A critic for The Pelican (1907) wrote that “the youthfulness, the dainty charm and grace, the prettiness and the exquisite dancing with which Miss Elsie invests the part…. I share the opinion of most of the first-nighters, who considered it could not have been in better hands, and could not have been better handled…. The night was a genuine triumph for Miss Elsie, and she well deserved all the calls she received”. She began as a child actress and before her big break had appeared in a number of Edwardian musical comedies. She was charming and beautiful and became one of the most photographed actresses of her time. Lily Elsie’s dad was a theater worker and her aunt was well known actress Ada Reeve. Shortly after the turn of the century she joined George Edwardes’ company at the Daly Theater. Some of her early appearances included “A Chinese Honeymoon”, “Lady Madcap”, “The Little Michus (1905)”. In the years between 1900 and 1906 she appeared in 14 shows. After the “Merry Widow” she appeared in 26 more shows including “The Dollar Princess” (1909) and “A Waltz Dream” (1911). She clearly was an actress who was in demand. Men paid her much attention but apparently she did not enjoy the attention. Lucile, her costume designer for “The Merry Widow” stated that Elsie was “absolutely indifferent to men and had once said that she disliked “the male character”. She added that men would only behave well if a woman “treated them coldly”. Now, some words about her marriage. In 1911 she he left the cast of a play in which she was performing to marry Major John Ian Bullough (1885–1936). Major Bullough was the son of a wealthy textile manufacturer. He was formerly married to actress Maude Darrell who only survived one year after their 1909 marriage. The marriage between Elsie and Bullough was reported to be very unhappy. Elsie’s health began to deteriorate and her husband pressured her to quit the stage and she was ready to do so. She returned to the stage during the war years (World War I) and was active in fund raising for the war effort. She next took a ten year break from the stage only to return once again. Her final performance took place in the Daly Theater in the play “The Truth Game” (1929). In addition to her theater career, Elsie made recordings, and appeared in two films, including D. W. Griffith’s “The Great Love” (1918). Also appearing in that film was Lillian Gish. In 1930 Elsie’s marriage ended in divorce. Her health began to deteriorate more and she developed hypochondriasis causing her to spend much time in nursing homes and sanitariums. Due to her psychological problems she had brain surgery. Her final years were spent at St. Andrews hospital in London. This postcard is part of a series (Arcadian no. A 26). The photographer of this image of this beautiful actress is the well known celebrity photographer, Rita Martin. She was considered one of the best British photographers of her time. She opened her studio in 1906. Martin’s sister, Lallie Charles was an esteemed society photographer. Many of Rita’s photographs can be found in the National Portrait Gallery. To view more photographs by Rita Martin in the cabinet card gallery, click on the category “Photographer: Martin”. The second postcard of Miss Elsie provides a terrific close-up photograph of the beautiful Miss Elsie. She is wearing a dark jacket, a frilly high collared blouse and a ribbon bow tie. Her accessories include a long necklace, a pin low on her blouse, and a corsage. The postcard is part of the Rotary Photographic Series (no. 4159 J) published by Rotary Photo. The photograph was taken by the Foulsham & Banfield Studio. Foulsham & Banfield were well known celebrity photographers. Frank Foulsham and A. C. Banfield operated a studio in the 1900’s through the 1920’s. The third postcard features Lily Elsie clutching a bouquet of flowers and glancing sideways at the photographer. She looks absolutely beautiful. She is wearing a fancy beaded dress and a bracelet. She stands in front of a window. This photograph, like the second postcard’s photo, was taken by the Foulsham & Banfield studio. The portrait postcard was published by Rotary Photo and is part of a series (11840 F). 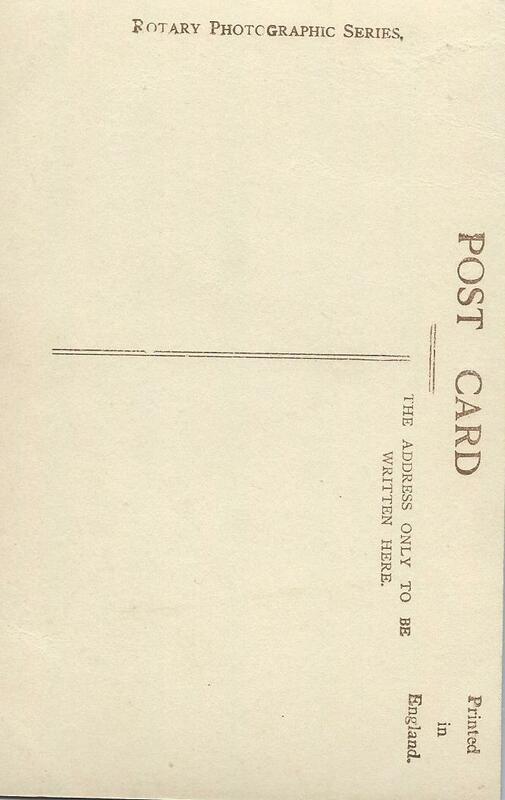 The postcard was printed in Britain. The fourth postcard is a portrait of a smiling Lily Elsie. She is wearing a flower, beads (pearls? ), and a hairband. This photograph was taken by the Foulsham & Banfield studio. The portrait postcard was published by Rotary Photo and is part of a series (11593 B). This postcard captures Miss Elsie in her role as Alice in “The Dollar Princess” (1909). The venue for the play was Daly’s Theater in London and cast members included Joseph Coyne, Gabrielle Ray, Emmy Wehlen, and Gladys Cooper. This vintage real photo postcard features English stage actress Pamela Gaythorne. She is quite attractive and wearing much jewelry and lace. Note her not so subtle hat. It looks as if a seagull is resting on her head. Miss Gaythorne is captured in this image as she appeared in “The Fascinating Mr. Vanderveldt. She appeared in this theatre production with Violet Vanbrugh and Arthur Bourchier. The IBDB reveals that Miss Gaythorne appeared in, and often starred in, 12 Broadway productions. Her Broadway career spanned from “Keeping Up Appearances” (1910) through “This Fine-Pretty World” (1923). The New York Times (2/14/1911) reviewed a play named “Nobody’s Daughter”. Gaythorne appeared in this play and in writing about her, the reviewer wrote that he “heartily commends” her performance. The article adds that she played her character with “delightful spontaneity, charm, variety, and suggested youth and spirit, while touching the more sentimental passages with manifest sincerity”. The photographers of this image was Foulsham and Banfield, a prolific celebrity postcard portrait studio. The postcard was produced by Rotary Photo and is part of a series (no. 4107 A). The message on this card is from Bob to Miss Marion Lipman and states “I will come in and see you when I go to the city”. Also written in the message section is what appears to be “The Empire Confectionary”. Perhaps a Cabinet Card Gallery visitor can throw some illumination on that term and also ascertain what nation the stamp of this postcard represents. The postcard is postmarked 1906. The top vintage real photo postcard features actress Miss Nora Kerin (1883-1970) as she appeared in the theatrical production of “The Prince and the Beggar Maid”. The actress is absolutely beautiful as is her costume. The play opened at the Lyceum in June of 1908 and ran for 82 performances. Miss Kerin played Princess Monica. The actress was born in London and her family was chock full of actresses including sister, Eileen Kerin and cousing Julia Neilson, Lily Hanbury, and Hilda Hanbury. Photographs of Miss Neilson and Mis Lily Hanbury can be found elsewhere in the Cabinet Card Gallery. Nora Kerin made her stage debut in 1899. In conducting my preliminary research about Nora Kerin, I was struck by the number of negative reviews of her acting that I encountered. One review concerned her performance as Juliet in “Romeo and Juliet”. The production was at the Lyceum Theater in 1908 and the review appeared in London’s “Daily Mail”. The reviewer wrote “‘Oh, Juliet. Juliet, wherefore art thou Juliet?’ This is, of course, an inversion and a parody; but, seriously, the Juliet of Miss Nora Kerin cannot be taken so. She declaims in the conventional old-fashioned style. She somehow destroys – on the stage – her own personality, and instead of looking the pink of charm and youth (as she is when “taking a call”) she manages to conceal both. Many of her lines were badly spoken, falsely intonated and punctuated. She had moments … melodramatic outbursts … but she is not the personality … she has not the witching simplicity of the real Juliet”. Clearly, Miss Kerin was not a luminary actress of her time. However, she was quite pretty and fifteen portraits of her can be seen in the National Portrait Gallery. The photographer of this postcard image was Rita Martin, a celebrated female photographer. She is considered one of the best British photographers of her time.Her studio was in an exclusive neighborhood at at 74 Baker Street, Marylebone. She was born Margareta Weir Martin in Ireland. Margareta “Rita” Martin started her career in photography in 1897 by assisting her elder sister Lallie Charles in running her studio. In 1906 Rita opened her own studio. She had a style of photographing subjects in pale colors against a pure white background and she tended to avoid photographing men and older boys. Rita had a specialty in photographing actresses including Lily Elsie and Lily Brayton. She was also well known for her child studies which often involved children of well known actresses. Lily’s sister, Lallie Charles was more known as an excellent society photographer. Many of Rita Martin’s photographs can be found in the National Portrait Gallery. A photograph of Rita Martin, by Rita Martin can be seen below. This vintage real photo postcard was produced by the Rotary Photo Company and was part of a series (no. 1796 Z). The second postcard portrait of Miss Kerin is also a good representation of her beauty. In addition she is wearing a beautiful lace dress and an extraordinary hat. The photographers of this terrific image, Foulsham & Banfield were well known celebrity photographers. Frank Foulsham and A. C. Banfield operated a studio in the 1900’s through the 1920’s. This postcard is part of the Rotary Photographic Series (no. 1796 H) and is of English origin and is postmarked 1907. The third postcard features Nora Kerin in her role as Juliet in “Romeo and Juliet”. Unlike the first two portraits, in this image she is wering her hair down and is projecting an air of innocence through the placement of her hands and her vulnerable expression. Just like the top postcard, this image was photographed by Rita Martin and the postcard was part of the Rotary Photographic Series (1796 S) by the Rotary Photo Company. This vintage real photo postcard features child actress, Miss Renee Mayer, posing in character for photographers Foulsham and Banfield. She is photographically captured in her role as Puck in the theatrical production of “The Sleeping Beauty Re-Awakened”. Note the cute little puppy that she is holding. Mayer was a child actress and dancer who made her stage debut in 1910 as the Pearl Fairy in “The Goldfish”. She is most noted for her performance as Puck in three revivals of “Sleeping Beauty” (1912, 1913, 1914). She acted in pantomimes throughout her teenage years and appeared in films in the early 1920’s including “A Bachelor Husband” (1920). Miss Mayer was born in 1900 which informs us that she was somewhere around thirteen years old when she posed for this photograph. The New York Times (1915) mentions Renee Mayer in an article about a play called “Masque of War and Peace”. Looking at the roster of cast members in this production, it becomes clear that the show had an all-star cast. Performers included Mme Rejane, Lily Elsie, Edna May, Viola Tree, Elsie Janie, Lily Langtry and of course Miss Mayer. The show was performed at the Drury Lane Theatre to raise money for “The American Women’s War Relief Fund”. Great Britain’s National Portrait Gallery has twenty real photo postcard portraits of Miss Mayer. Three of the images are photographs by Foulsham and Banfield and published by Rotary Photo (just like the image above). This postcard is part of the Rotary Photographic Series (no. 6924 B) and was printed in Britain. 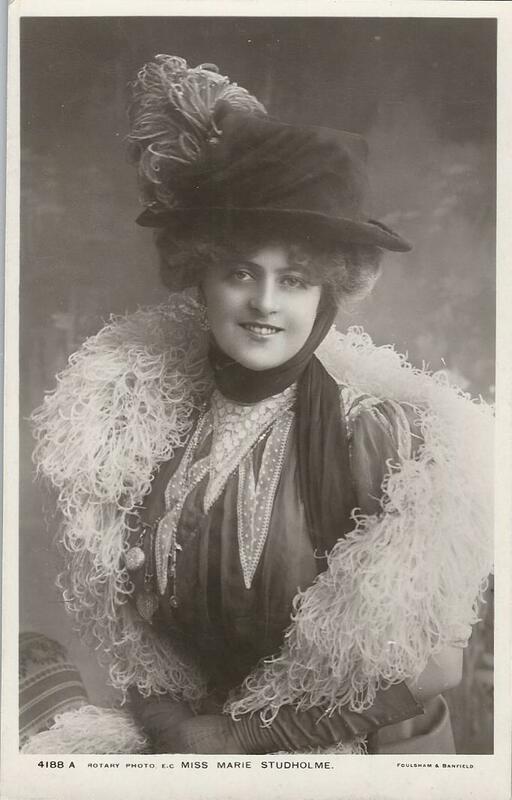 This vintage real photo postcard features beautiful stage actress Marie Studholme (1872-1930). The English actress and singer was known for her supporting and starring roles in Victorian and Edwardian musical comedies. Her theater career spanned from 1891 through 1915. Her roles included appearances in “An Artists Model” (1895), “The Messenger” (1900), and “Lady Madcap” (1906). Marie Studholme’s beauty made her one of the most popular postcard models of her time. This postcard was part of the Rotary Photographic Series (no. 4188 A) and was printed in England. Miss Studholme’s portrait was photographed by the celebrated Foulsham & Banfield studio. Although photo postcard portraits of Miss Studholme are common , this particular photograph is uncommon.